Printers are arguably the most notoriously problematic technology in the world today. Whether printing fifty pages of Wingdings, printing away a small fortune in ink, or just obstinately refusing to print anything at all, printers are constantly causing headaches at home and in the workplace. They are the undisputed black sheep of the computer world––right up there with the office copy machine. So it goes without saying that anyone with the magic-touch ability to fix these inept low-tech monsters is an extremely valuable person. Fortunately for us, we live in a world with Reddit––a world where becoming a printer-hacking guru is as easy as sifting through a few wit-packed threads. Here are the top five printer hacks Reddit has to offer. By now, most of us are aware of the fact that buying printer ink is an experience closely resembling extortion. The cartridge is clearly still half full––the last page doesn’t have a single streak in it––and yet the printer is adamantly insisting my ink is empty. It flatly refuses to print in black, until I buy a new yellow ink cartridge. If this sounds familiar, you’re not alone. And if you happen to own a Brother printer, you’re in luck. Reddit user whlabratz says all you need to do is locate the ink level sensor on the cartridge and put a tiny strip of black electrical tape over it. Fool the light sensor and you’ll save big. Rumor is this trick also works on other printer models, though the sensor might be a bit tougher to locate. This confoundingly genius hack is courtesy of Schrodingers_Sneetch: If your old HP printer inexplicably stops printing one day, and refuses to yield to any conventional troubleshooting techniques, it is time to pre-heat the oven. Seriously. Take out the formatter board, and bake it in the oven at 375 degrees Fahrenheit for 5-8 minutes. Re-install it and the printer will be as good as new. Or it might just be a slightly warmer version of the worthless POS you had before. Still no consensus on exactly why this one works, or how it was discovered, but it does work––sometimes. For Mac users, AirPrint is the latest and greatest in mobile printing solutions. But for those without an AirPrint-compatible printer, it can seem like a tantalizingly useless feature. Luckily, Reddit user skier_scott has a surprisingly easy workaround. If you have a Mac in the network, downloading Printopedia renders your machine AirPrint ready in seconds. Victory! 2. Segregation in the Workplace? As previously discussed at some length, ink is criminally expensive. So if you’re looking to reduce overhead in the office, you might want to limit your employees to black-and-white printing. But because a few people in the office will inevitably still need color, you can’t simply set the machine to B&W only. If you have an HP color laser printer, janpjens suggests you download mono-only drivers from the HP website and install them throughout the office. That way, certain workers can use the color drivers, others can use mono-only, and the company saves money. 1. Someone Using Your Wifi? This hack, while perhaps less practical than the others, is nonetheless incredibly useful. It comes from the twisted imagination of wildmonkeymind, who suggest that if you discover someone using your wifi, you should print maps on their printer. Start with a simple world map, and every hour print a slightly more zoomed in version, until you have the google map street view of your neighborhood. Despite offering up these brilliant solutions, it seems the Reddit community has another useful consensus when it comes to printers: don’t own one. 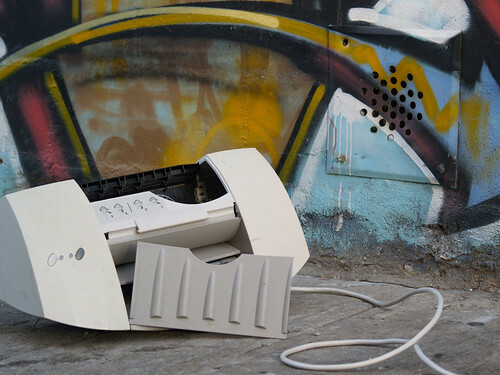 Think of all the hours of frustration, disappointment, and anger––not to mention money––you could save by scrapping your printer and using the one at work whenever you need to print something essential. We live in a digital age: an age of smartphones, tablets, and laptops. Why not join the 21st century and save yourself the effort of browsing Reddit every time your printer breaks? This article was written by PrinterInks.com, suppliers of top brand ink cartridges and printer supplies throughout the UK and Europe. I have used HP printers for years with the only problem being the price of ink!! They have taken their business to CHINA and their are problems. NO INK in brand new cartridges. They fix it by sending you XL cartridges and charge you for it. Getting ink from other sources is not a good idea if you print pictures. Expensive is not the word but is handy for those special family pic’s of newborn relatives or being a Great Grandfather for the first time.